It’s been a bad year for Patrick and Barbara McDougall. The couple are both Wisconsin schoolteachers who get laid-off. Pat decides he and Bar need a vacation, and thus books a reservation for a reasonably priced motel along beautiful, beachfront US1 in Broward County, Florida. Pat assures Bar he remembers how lovely US1 is from when he was a young boy, and that the vacation will be great for them, just to get away and relax on the beach right next to their motel. The problem is that Pat has missed one small detail. It’s not US1 that provides the idyllic beachfront paradise he and Bar hope for: it’s A1A. US1 is a cesspool of pill mills, tattoo parlors, strip clubs, and sleazy motels catering almost exclusively to hookers and drug dealers. Fortunately, Florida’s biggest fan (and most-creative serial killer) Serge Storms swoops in to show Pat and Bar the sights, saving their lives, if he doesn’t get them killed first. Serge Storms is my favorite character in all of the comic-mystery genre. Yeah, he does kill people, but only those who are empirically “assholes.” This time out, Serge knocks off a couple of horrible bullies, as well as the two men who have Pat and Bar caught in a crossfire. Naturally, we also find Serge has added a new job to his CV: reality show producer. He and his perma-buzzed sidekick, Coleman, are working on a pilot about “The REAL Florida,” which gives Serge a chance to show off his encyclopedic knowledge of Florida minutiae. This task also gives him opportunities to dispense his creative vigilante form of justice wherever needed. If you’ve read any of Tim Dorsey’s novels, you know Serge and Coleman. If you haven’t, you’re missing-out on the funniest series of its kind. Serge shows such exuberance in everything he does, whether it’s playing jellyfish hockey (a new game he invented), touring the site where an obscure game show was once filmed, or just trying to make the world more polite. 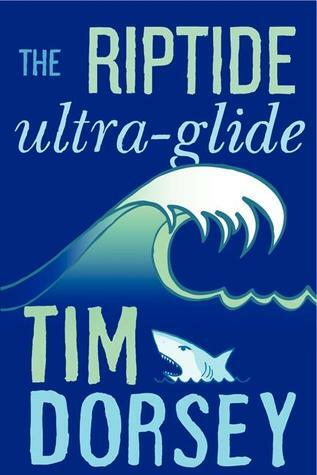 “Riptide Ultra-Glide” is one of the longer Serge Storms books, but also one of the funniest. There’s an added comic subplot involving Coleman as an unwitting celebrity among the stoner-American population. Pat and Bar McDougall did not end up with their perfect beachfront vacation. Far from it. Between the airline, the motel, various criminals, and all manner of other horrors, meeting up with Serge fits right in with their luck. Hey, at least they get a grad school-level course on South Florida arcana. And the more they learn about The Sunshine State, the more they can’t wait to get back to Wisconsin. This entry was posted in Books, Humorous, Mysteries/Thrillers, series. Bookmark the permalink. I read the first of the Serge books, and that convenience store scene with the redneck and the Hispanic tough guys is still imprinted on my brain. I lol’d a lot at this one. Especially jellyfish hockey, and when he took out two assholes with part of an MRE kit. This one was almost all in South Florida around Fort Lauderdale. I’m hoping his new one, “Tiger Shrimp Tango” (of which I have an ARC I will read tomorrow, after ordering pizza and beverages so I don’t have to interrupt my reading thereof) is set here in the Sodom-Gommorah Metro, like many of his. I always love when Serge and Coleman end up in a bar where I’ve gotten ‘faced. I’m not sure which of his killings is my favorite. I like when he hollowed out the guy using liquid nitrogen, but my favorite is probably when he offed the mean Little League coach with a Water Wiggle hooked up to a pressure washer. Brilliant.